Teach responsibility while making sure the job gets done. Cleaning up after a fun day of play is probably tops on your preschooler’s “Things I Don’t Like to Do List.” But unless you want to spend your time tripping over the Little People and their school bus (and their farm and their zoo and their Ferris wheel), your preschooler needs to learn how to clean up toys. An important part of a young person’s development, cleaning up a mess they've made themselves helps develop your preschooler's sense of responsibility. While it might be easier for you to just do the cleaning up yourself, that's just a short-term solution. How a child learns to clean up now sets the stage for how they will complete the chore as they get older. If you are constantly picking up after your child at this age, they’ll learn to always expect it. And then, as they get older they either won't know how or won't think it is something they need to concern themselves with because mom and dad always do it. Don’t just say “clean up.” It is easy for a preschooler to be overwhelmed by a big mess, often because they don’t know where to start. Instead, try “Put away your cars first and then move to the books.” By breaking the job down into little tasks, a seemingly-endless chore becomes manageable. Remember, your child is new to the cleaning up business. Cleaning up toys isn't something they inherently know how to do. You'll need to teach them. To you it's obvious, but to your preschooler, cleaning up is nothing more than putting away the fun. (And who wants to do THAT?) Explain how if toys aren't put away correctly someone could trip and hurt themselves, or pieces could get lost and then playing with this particular toy next time won't be quite so fun. With young children, it is important to make a connection that they can relate to. Place removable picture labels on drawers and bins to help kids learn where everything goes. Have your child either draw or cut out of magazines pictures of specific items (blocks, puzzles, games) that go into each one. Under the picture, neatly write the name of the item (great word recognition for pre-readers). When everything has a rightful place, it makes it that much easier to put them away. Blast Dan Zanes or The Wiggles while cleanup time is underway. It makes the job go faster and the peppy music will keep your child in a good mood. Or sing your own songs. "This is the way we pick up blocks, pick up blocks, pick up blocks. This is the way we pick up blocks, as we clean up your room!" Set the kitchen timer for 10 minutes and challenge your preschooler to “Beat the Clock.” Or ask, “Can you finish putting these puzzle pieces away before I put away the doll clothes?" 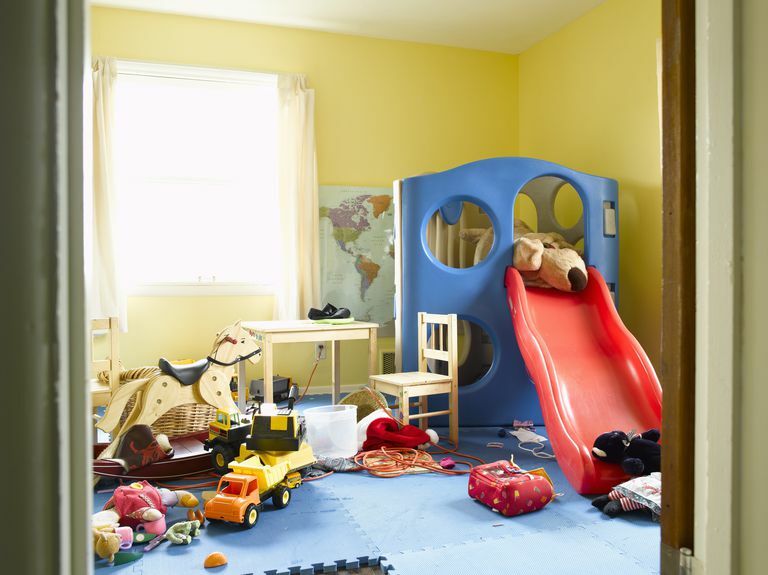 When your child's room or playroom is finally clean, don’t redo what isn’t perfect. Lumpy bed sheets? No need to smooth them. Mismatched dollhouse furniture? Ignore it. As long as the job was done properly, just leave it be. A 4-year-old will never clean up as well as an adult. And if you go ahead and redo what they've already worked so hard to complete, your little one might not be so inclined next time to do the job since you fix it anyway. In this case, the end result is not as important as the effort.